Who does our thinking for us? 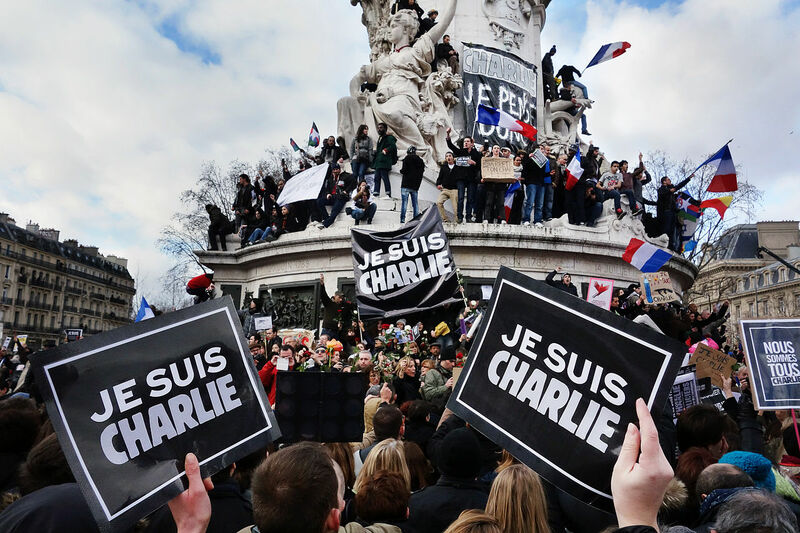 Most of us were horrified by the killings in Paris last January. #JeSuisCharlie went viral around the world and perhaps you were one of those who tweeted or shared it? On the other hand, maybe you felt the cartoonists brought their deaths on themselves for insulting religious sentiment? Either way, no one tried to justify the murders and we were all shocked by the inhumanity which took place. It’s easy to feel rage and seek justice – or maybe even revenge – on those responsible. The person who said it? Adolf Hitler. You might wonder why I kept a quote on display from such an evil man. It was simply to encourage young minds to think for themselves. Nowadays, as a freelance writer, I spend a lot of time on the internet (researching, of course, not playing!) and I’ve read much of what has been written in reaction to the Charlie Hebdo killings. It worries me to see how people prefer to be told what to think rather than choose to think for themselves. Last year, for the first time in my life, I experienced someone trying to harm me. I could never have expected it from a former friend; the effect was stinging and especially hurtful to my family. Since then it has been difficult to keep treating this person respectfully and to resist the urge to strike back. I got a glimpse then of what my British Muslim friends feel every time they are spat at in the street, told to ‘go home’ or accused of being terrorists. They are ordinary Brits trying to get through life like you and I. They are hurt when made scapegoats, out of the blue, for something they have nothing to do with. Yet the media continues to feed us the message that Muslims (or whatever other group media moguls want to harass) are dangerous. The facts tell us something very different. 98% of all terrorist attacks in Europe have no religious motivation at all. In America, since 9/11 only 37 lives have been claimed by Islamist attacks out of more than 190,000 murders. Just 24 hours before the Paris murders a 40-year-old white man detonated a bomb in Colorado Springs outside the offices of a civil rights movement for the advancement of black Americans. He too was motived by ideology yet we heard nothing of this attack which was reported as ‘an isolated act of violence’. Only the Paris murders received airtime and were labelled ‘terrorist’. I could go on but the point is this: we’re not told the whole truth. With elections coming up soon, it’s important we really do take note of what we’re told and confound ‘men in power’ by checking the facts ourselves, looking at all the arguments before deciding who should run our councils and country. Thanks to the internet this is easier than ever before. Perhaps we’ll even avoid leaping onto bandwagons (or tweeting hashtags) and believing whatever rubbish we’re told. You are right. The US, most especially , is definitely not lily white, and can’t be holier than thou.